As much as I mourn the end of summer, fall is pretty great in its own way too (I guess...). Cooler weather means more time to play outside comfortably. College football is on every weekend. Pumpkin patches are fun. Halloween is awesome. Jumping in the leaves is a rite of passage. And comfort food is here for the long haul. 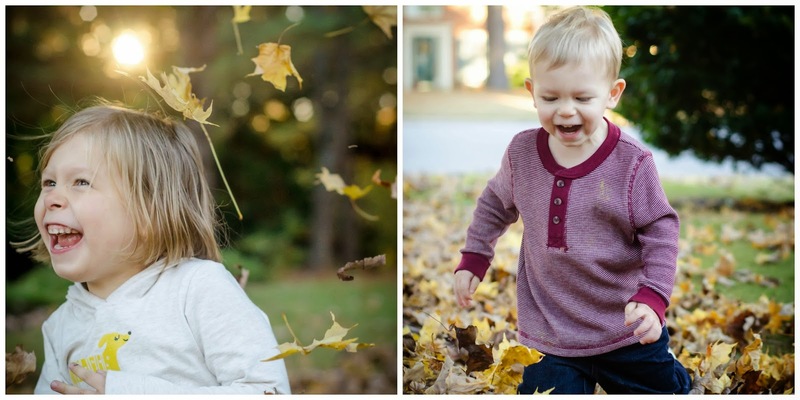 We've been making the most of fall this year, and Caroline and Smith are especially loving all the time outdoors. Joey got some pretty cute pictures of them over the weekend, so I thought I'd share them with you. And I've been making the most of fall with all the delicious fall-inspired recipes. This fall-harvest pear salad has made many appearances on my dinner table this year, and I've been taking advantage of winter squash, apples and pears, cranberries, and greens in my cooking. 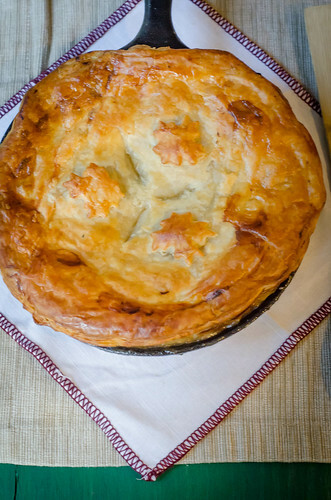 and fresh sage, you have a wonderfully comforting and seasonal pot pie. 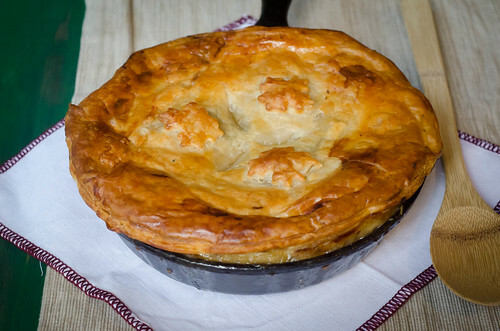 In lieu of a traditional pie crust, this pot pie is enveloped in buttery, flaky, puff pastry. It's a simple twist, but it really puts this over the top (side note: I used store-bought puff pastry this time, but I'd love to try this homemade whole wheat puff pastry. I think the wheat version would be a great addition to the comforting, fall-inspired filling). What's more, this is a great make-ahead meal. I assembled the whole thing in the morning, then kept it chilled in the refrigerator all day. Dinner time was so easy and stress-free! And it doesn't dirty every dish in your kitchen. The pot pie is baked and served in the same skillet you use to make the filling - I love my cast iron pan! If you're looking for a fun twist on chicken pot pie, give this a try. I think it would be a great use for leftover turkey as well. I'm always looking for ways to reinvent my Thanksgiving leftovers, and this is a great option! On a rimmed baking sheet, toss the squash with 1 tablespoon of olive oil, salt, and pepper. Arrange in a single layer and bake 25 to 30 minutes, stirring halfway through. Remove from the oven and set aside. Over medium-high heat, melt the butter in a 10 to 12-inch cast iron skillet (or another oven-safe skillet). Add the mushrooms and shallots and cook 5-6 minutes, stirring frequently, until light brown. Add more butter if needed. Add the flour and cook, stirring constantly, until light brown, 3 to 4 minutes longer. Slowly stir in the broth, scraping the browned bits from the bottom of the pan, and bring to a gentle boil. Stirring often, cook until the sauce is slightly thickened, 5-6 minutes. Stir in the chicken and the sage, and season with salt and pepper (start with 1 teaspoon of salt and 1/2 teaspoon of pepper, and adjust from there). Reduce the heat to medium and cook until the mixture is thick and creamy, about 10 minutes, stirring frequently. Remove from heat, stir in the squash, and allow to cool slightly. Taste and season with salt and pepper as needed. Meanwhile, roll out the puff pastry on a lightly floured surface - just enough to to even out the lines. Cut the pastry to fit the top of the baking dish, leaving enough excess for the pastry to drape over the edge by just 1/2 an inch or so. Gently place the puff pastry over the filling, and cut a few slits in the crust to allow steam to escape. Decorate with the extra puff pastry if you'd like, and brush the top with the egg wash. Place the skillet on a baking sheet and transfer to the refrigerator for at least 1 hour. When ready to bake, preheat the oven to 375 degrees. Transfer the skillet + baking sheet to the oven and bake until the filling is bubbling around the edges and the pastry is golden-brown, 45 to 50 minutes. Remove from the oven, allow to cool slightly, and serve. All the mushrooms in this would make me very, very happy. I made pot pie this week too!! Great minds. :) I love your fall twist. This definitely is a great time of year for food. 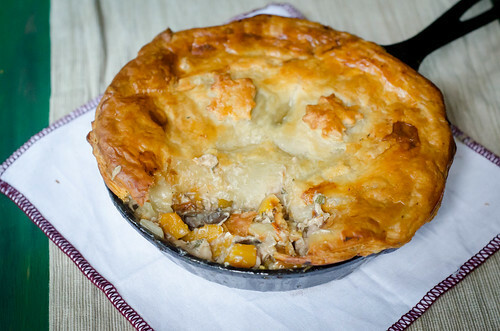 We love pot pies and your looks delicious! Thanks for the recipe! Your children are cute!